He also lived in Paris, in Belgium, in Germany and Austria and studied literature before discovering the photographic works of Man Ray and Max Ernst’s Surrealist paintings. He first opted to become a photographer and with Camille Bryen published in 1934 some poems and photos. Then Ubac became acquainted with engraving working in Hayter’s studio in 1936 in Paris. From 1936 until 1939, Ubac worked closely with the group of Surrealist artists in Paris and his photos were often published in the famed «Minotaur» magazine. At the outbreak of World War Two, Ubac sought refuge in Carcassonne and started to produce drawings. Back in Paris in 1942, he befriended some poets such as Jean Lescure, Raymond Queneau and Paul Eluard and provided six photos for the illustration of Lescure’s «L’Exercice de la pureté». From then on, Ubac produced large ink drawings and took part in the activities of the «Main à Plume» group, which was trying to perpetuate the spirit of Surrealism at that time. Ubac exhibited his photos and drawings in Paris in 1943 but gave up his photographic activities two years later in order to devote himself to the production of drawings and gouaches. He took part in three exhibitions, which took place in London, Brussels and Paris in 1946 and started to engrave tiles at the same time. A year later, Ubac produced his first paintings though he preferred the use of tempera instead of oil. 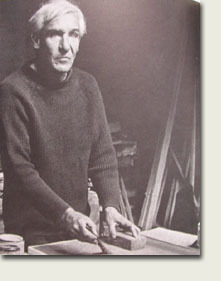 In 1950, Ubac exhibited his engraved tiles and developed his carving technique on such medium. After befriending Jean Bazaine, Ubac turned towards abstraction giving a priority to perception and creation as well, producing either vertical or horizontal checker-boards, which were seldom coloured with large black patches using various pretexts regarding their significance. Until 1955, his paintings tended to express a will for some change. That year, he produced a painting containing large tile fragments and painted a similar work a year later. However it was not until 1966 that Ubac decided to show works marrying paintings and low-relief effects, which included a plastic vocabulary implying some conceived organisation. Ubac was then painting as if he had been carving a sculpture creating furrows and stratified zones as if he had been striving to be in contact with the earth and its soil inside some kind of architecture. Ubac took part in many important exhibitions from 1953 in Belgium, Italy, Switzerland, France, Brazil, Germany, the U.S, Canada, England, Japan and South America. Ubac also produced many architectural integrations such as a tombstone for the de Chambure family in 1955, a wall made of tiles in Pittsburgh in 1957, a mosaic and tile wall in Evian, stained glass works for several churches, mural mosaics and tapestries.